Our children are special. Of this fact there is no doubt. And, without question, the game of chess helps them realize their potential. This is because it helps improve their ability to think more independently and critically about whatever they encounter in the streets, schools and homes of our community. It causes them to think about consequences…Furthermore, chess is math. It is a game that requires the constant calculation and recalculation of multiple numerical problems at the same time. 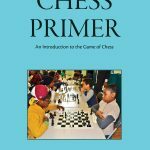 The leap in thinking that occurs in a child when s/he is required to simultaneously consider the present and possible moves of 32 uniquely moving pieces continuously traversing a 64 square board is truly amazing to witness…[Chess Primer] has been specifically designed to help simplify many of the concepts and ideas fundamental to the game of chess so that they can immediately begin to play and test their skills out on each other. In that this is a revised edition, it should be noted that I have made a number of changes that should improve on the original’s quality. The reader should first notice a change in the presentation. The size of the book has been reduced, making it more practical as a portable reading tool. The text and graphics (tables, charts and figures) are clearer and of a much better professional quality. Within the introductory chapter more historical and culturally centered analysis has been provided for those to whom this was written. More practice and playing tips have been inserted at appropriate points and a list of “Rules to Learn to Win By” is found at the end of Chapter 6. Of equal importance, sets of one- move and two-move checkmate problems have been placed at the end of the text so that novices can begin to systematically practice the art of mating. And last, but not least, a short, selected bibliography has been added for those who wish to take their game to the next level.